Perry Street Brewing now offers a sandwich menu. Beer pairs with a lot of things. So do sandwiches. Thus, it's fitting that Perry Street Brewing recently debuted a lineup of tasty sandwiches that all pair well with its craft beer offerings. After struggling to keep a consistent lineup of food trucks parked outside its front door, brewer Ben Lukes, who owns PSB with his wife Christy, tapped into the talent of Cordon Bleu-trained employee Alisha Van Guilder to expand the brewery's in-house food menu. Adding to its list of savory small plates — a charcuterie board, hummus and veggies and pub pretzels with beer cheese — the new menu features six housemade sandwiches, including a turkey banh mi (grilled turkey, cranberry chutney and pickled veggies, like its Vietnamese namesake) and a pork belly BLT. All sauces and other toppings on the sandwiches are made in house, in Perry Street's "shoebox-sized kitchen," Lukes says. Priced from $6 to $13, the sandwiches come with a beer-brined pickle and choice of kettle chips, potato salad or garden salad. Vegan and vegetarians can sub in a quinoa patty on any option. In keeping with its kid-friendly environment, the brewery also added two "Kiddos of PSB" options; a grilled cheese and peanut butter-and-jelly sandwich, for $5 each. Note that the new sandwich menu yet isn't available at all hours (currently at these times: Tue/Thu, 4-8 pm; Fri, 4-9 pm; Sat/Sun, 11 am-9 pm), although small plates can be ordered at any time. 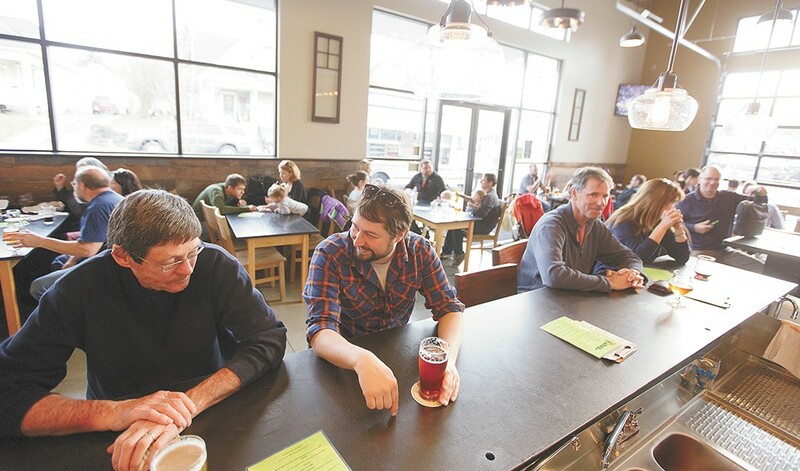 As the seasons change, these new food options will be updated to reflect what's seasonally available, Lukes says, as the brewery plans to source locally as much as possible.